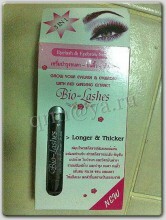 Bio-Lashes eyelash & eyebrow serum, made in Thailand. A unique product of Thailand. Good quality. 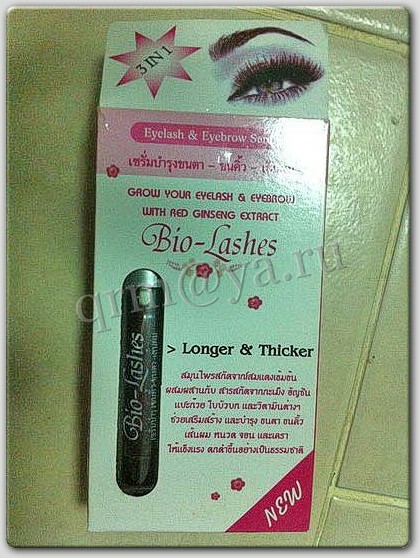 Grow your eyelashes and eyebrows with the help of Red Ginseng extract. Your eyelashes and eyebrows will grow longer and thicker! Apply 2 times per day on your eyelashes and eyebrows to moisturize them and stimulate the faster growth of hair. Remove all make-up from eyelashes and eyebrows, clean and dry your eyelashes and eyebrows before applying the serum. Regular mascara can be applied over Bio-Lashes serum, no problem. Apply Bio-Lashes serum every morning and evening, 2 times per day. After 2 weeks of regular use you will notice that your eyelashes and eyebrows became thicker, stronger and healthier. This serum will help to enhance their natural beauty. Bio-Lashes serum is also good for men to improve their mustache and beard. The mustache and beard will be stronger, thicker and busher. Био-комплекс просто супер!наносила только три раза перед сном и уже вижу результат-реснички окрепли,заблестели и потемнели.спасибо большое за прекрасный и натуральный продукт!!! Click the button below to add the Bio-Lashes Eyelash & Eyebrow serum to your wish list.